Nigerian Segun Odegbami has failed in his bid to stand in February's Fifa presidential elections. The 63-year-old former international was unable to win the required backing of five member associations. 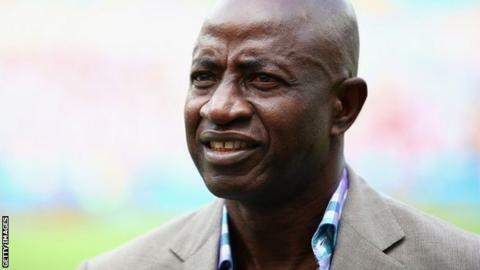 Odegbami said Nigeria's Football Federation offered him its support too late to meet Monday's deadline. "The NFF only sent their nomination letter to Fifa (on Monday afternoon). What was I supposed to do with that?" Odegbami told BBC Sport. "That was their reaction to my letter sent to them two months ago. It is preposterous." Odegbami also believes that his outspoken criticism of long-standing Confederation of African Football president Issa Hayatou may have counted against him. "Of course there are local politics within the Nigerian and African football system that pitches some of us against the established system," he said. "I have been one of the most virulent critics of the perpetuity of Issa Hayatou in office and I knew I was not one of his best friends." Nicknamed 'Mathematical' for the precision of his play, the 1980 Africa Cup of Nations winner announced his candidacy on 1 September. Odegbami says Amaju Pinnick, the president of the NFF - the only member association to back him - was on Confederation of African Football business on Monday in the Egyptian capital Cairo where he tried in vain to secure support for the former winger. "The local politics within Nigerian football created a delay in nominating me. By the time the NFF did it was too late in the day for me to secure the necessary endorsements from five different countries. I had only a few hours to do so," Odegbami said. "My intention was to get them from a few neighbouring countries as soon as I got the nomination through. By the time I was officially informed the African FA presidents had all congregated in Cairo, Egypt for their scheduled Caf meeting. "I could not go there at such notice because I did not have the visa to Egypt. The president of the Nigeria Federation decided he would take up that responsibility and convince his friends in Caf to endorse me. Apparently he did not succeed for whatever reason." NFF president Amaju Pinnick refused to respond to questions on why it took them so long to endorse Segun Odegbami. "We thought he had the other nominations and ours was just the icing on the cake," he said. "I did my best as president of the Nigeria Football Federation. We did our human extreme best but other FAs were already committed to other candidates." Pinnick also dismissed suggestions that he may have been slowed down by another interest group from Nigeria. Odegbami will now continue with his other interests, which include running a football academy back home in Nigeria, although he insists he has not given up on football administration. "My responsibility to football now is to find an inroad into administration at the highest level because I can see what most cannot about the power of football to change the world. "I thoroughly enjoyed the journey and learnt a great deal about the politics in continental and world football, and how humans behave under certain situations. "Believe me the drama in Fifa has not ended. Indeed, I believe it has only just begun." Eight candidates did successfully make Monday's deadline in time to be registered. The list includes two Africans: South Africa's Tokyo Sexwale and Liberia's Musa Bility. Subject to vetting by Fifa's Electoral Committee, they will be joined in the race by Michel Platini, Sheikh Salman bin Ebrahim al-Khalifa, Gianni Infantino, Prince Ali bin Hussein, David Nakhid and Jerome Champagne. However the bid by Uefa president Platini is subject to him winning his appeal against a 90-day suspension imposed by Fifa's Ethics Committee earlier this month.